Over the past week I could observe on four evening: 11/12, 15/16, 16/17 and 17/18 August. Targets imaged on these nights were the three KH-12 Keyholes (USA 129, 161 and 186), the Japanese prematurely defunct SAR IGS 1B, and the US SAR Lacrosse 3. USA 186 (05-042A) provided a nice mag. -2 flare on 16 Aug at 20:52:07.0 UTC. 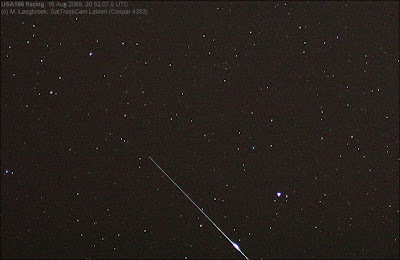 It was captured in an image, but unfortunately a too hasty camera pointing meant the satellite run out of the image before the end of the exposure. the flare is on it though, close to the image edge. Below is a crop of the relevant part of the image, and the derived brightness profile. Note that the "saw-tooth" pattern in the profile is due to the satellite trail being at ~45 deg angle to the pixel orientation, i.e. it is an artifact of the pixel grid. In a moment of boredom last weekend, I designed something long overdue for SatTrackCam Leiden (Cospar 4353): a logo. It is a bit inspired by the "patches" the NRO employees create for their covert space missions (see here and here for a discussion and examples). Hence all symbols used have some meaning (have fun interpreting!). The Latin(ish) roughly translates to "All Your Nightly Secrets Are Belong To Us", a pun at the NRO's credo "We Own the Night" used in some of their patches and the infamous "All Your Base Are Belong To Us" of gaming/internet lore. Nice image of the USA 186 flare, i've always found it hard to image the keyhole flares. Predictions have always been off. Much earlier in the year I saw an amazing (very) bright blue flare from USA 129 and have been eager to see another since. I saw a pass of USA 129 and USA 186 last night (NW UK), very easy to see. Almost together. Keyhole flares currently cannot be predicted. It is a matter of luck to catch them on an image. 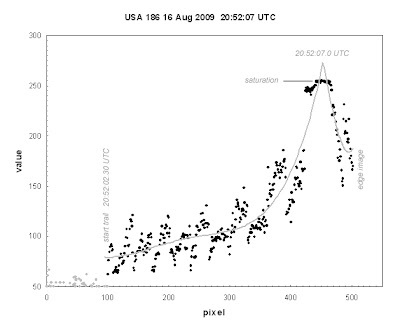 I've been using Heavensat 2.1.4 (not later) to predict keyhole flares (as iridium flares in the program). Seems to work, but not accurately. As you say, its more about luck.